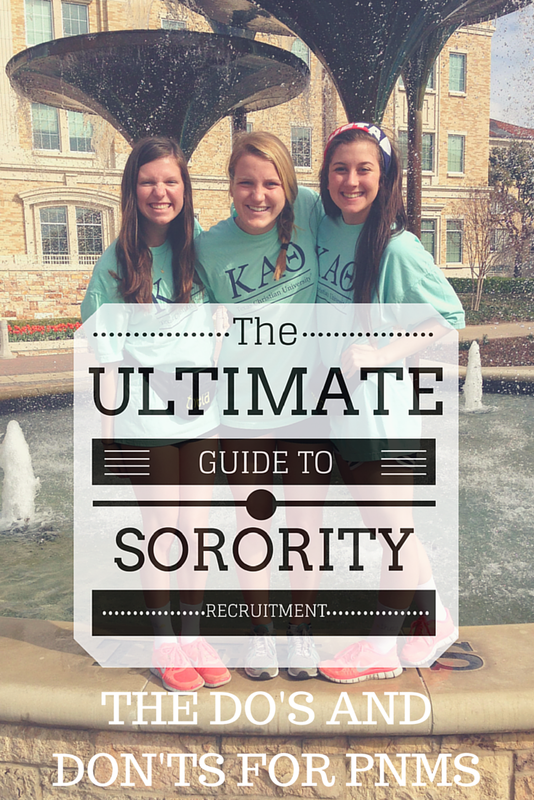 If you’ve been following along with my sorority recruitment series, you’ll realize I’ve thrown a lot of information your way. This can be very overwhelming and I realize you already have enough stress on your plate! This post is your short & sweet summary of the do’s and don’ts for PNMs. If you’re new to the series, PNM stands for potential new member, the girl going through recruitment! Do keep an open mind! This will save a lot of stress and will allow you to keep your options open! Do keep a smile on your face. Nothing makes a girl more beautiful then a big smile, and you will automatically look confident and happy when walking into each house! Do be polite. Say your “please & thank you’s” and be gracious to each girl you meet. Do make friends with other PNMs. This is your first opportunity in college to meet new people and absolutely everyone is looking for new friends. Feel free to chit chat in line and during break rounds, just avoid gossiping! Do be real. Don’t put on a fake personality just because you want to be in a certain house. You will no be happy if you join a house that isn’t you. Do stay hydrated. Nothing would ruin your recruitment experience more than passing out in the hot summer sun. Yikes! Do give your full attention to each girl you talk to. Nothing is more rude than constantly looking around and not engaging in a conversation. Do wear something you’re comfortable in. If you’re constantly adjusting your straps, can’t breathe in a dress or feel ugly in something. Don’t wear it! You’ll be happier if you’re in something you’re comfortable in. Do talk to your Rho Gamma/Gamma Chi. They’re there to help you, so if you have questions or concerns don’t hesitate to talk to them! Do have fun! Recruitment isn’t meant to stress you out or make you pull your hair out. Enjoy it! Don’t listen to other’s gossip and opinion on houses. This is your recruitment and you deserve to make your own decisions! Don’t talk about controversial topics such as partying, politics, alcohol, religion, etc. Don’t lie about anything on your resume. This includes, but is not limited to, your GPA, your leadership roles, your class rank or your legacies. Don’t speak badly of anyone. Whether this is an entire chapter, another PNM, a girl back home or a girl you graduated with. This makes you look bad no matter the circumstance. Don’t complain. Anything more than a tiny comment about the weather makes you look like a complainer. Keep it positive! Don’t brag to others about what houses you still have later in the week. They may be upset they were cut and you do not want to cause bad blood this early in the school year. Don’t ignore the dress code for each day. If panhellenic suggests sundresses, wear a sundress. You don’t want to be over or under dressed. Don’t only talk about yourself. Be sure to ask questions and show your curiosity about each chapter! Don’t get too caught up in the process. It’s only recruitment and you should be focusing on having fun and finding your sisters! Have any other questions? Check out the rest of the series here, or email me at seekingthesouthblog@gmail.com!